The Mark Samuels Lasner Collection at the University of Delaware Brings Late-Victorian Britain to Life By Alexander Lawrence Ames Alexander Lawrence Ames is a doctoral candidate in history and museum studies at the University of Delaware, a member of the Grolier Club in New York City, and a former graduate assistant in the Mark Samuels Lasner Collection at the University of Delaware Library. Writer, designer, socialist, and printer William Morris wrote this partial catalogue of his library at Kelmscott House in his own beautiful calligraphy ca. 1890. Courtesy of the Mark Samuels Lasner Collection at the University of Delaware Library. Names like William Morris, Oscar Wilde, Christina Rossetti, and Aubrey Beardsley call to mind a golden age in British art and literature as tantalizing as it is distant from the lives of most modern Americans. For visitors to the Mark Samuels Lasner Collection, a recent gift to the University of Delaware Library, however, the spirit of that long-vanished epoch comes to life in the form of more than 9,000 books, manuscripts, and artworks made by, and exchanged among, late-Victorian movers and shakers. Assembled over a lifetime of collecting by noted bibliophile Mark Samuels Lasner, the donation makes the state of Delaware an undisputed center for Victorian studies. Pre-Raphaelite artist Edward Burne-Jones kept this visitor’s book at his country retreat in Rottingdean, Sussex, between 1881 and 1898. 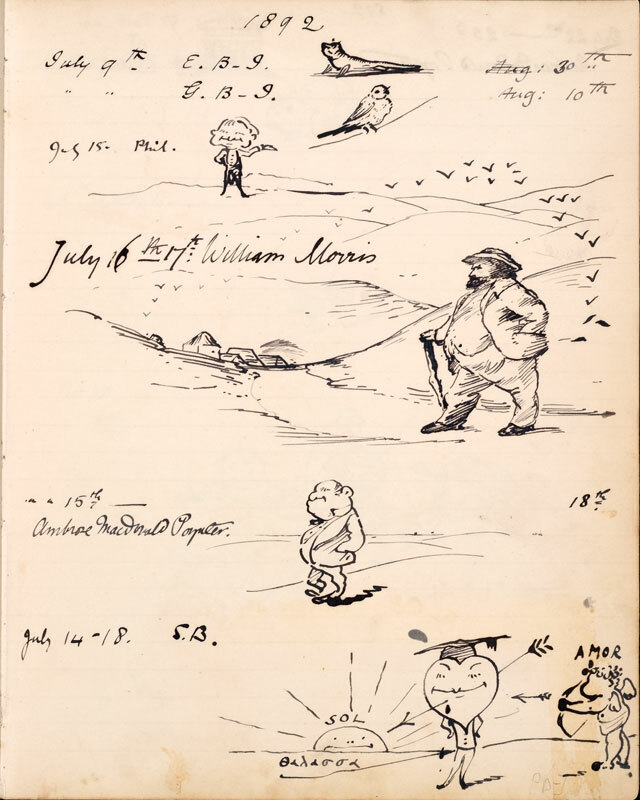 The page seen here, from 1892, contains a caricature of his close friend and collaborator William Morris next to Morris’ signature. Courtesy of the Mark Samuels Lasner Collection at the University of Delaware Library. 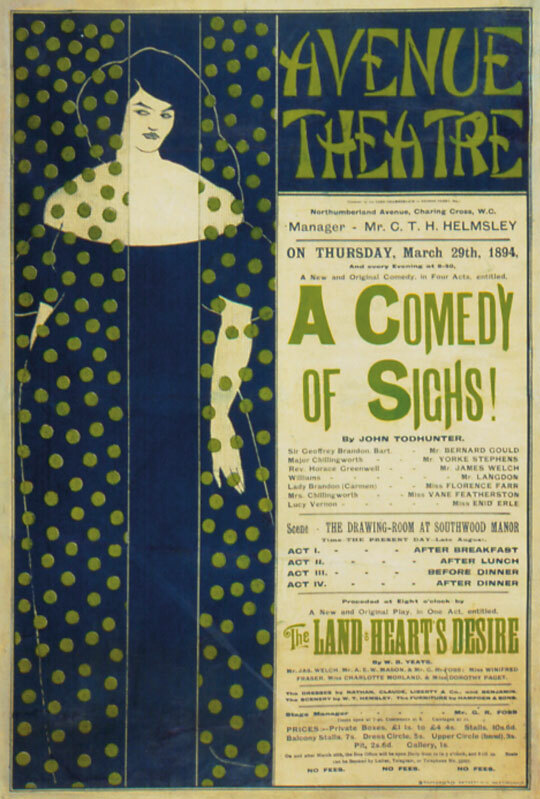 Aubrey Beardsley’s 1894 poster to advertise the Avenue Theatre productions of John Todhunter’s A Comedy of Sighs! and W. B. Yeats’ The Land of Heart’s Desire is a well-known (though incredibly rare) precursor to the Art Nouveau movement. Courtesy of the Mark Samuels Lasner Collection at the University of Delaware Library. 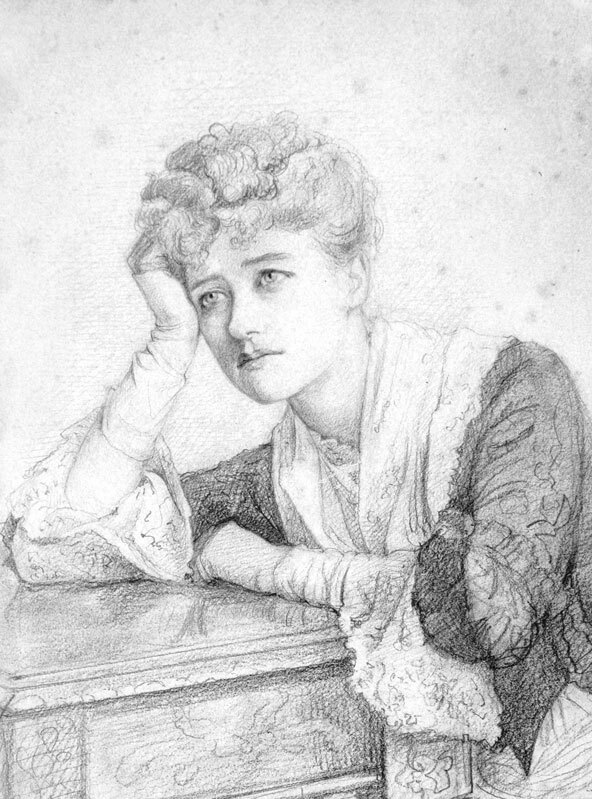 This 1878 pencil drawing of Ellen Terry by Violet Lindsay, later Duchess of Rutland, depicts the famed actress as Olivia, the title role in W. G. Wills’ adaptation of Oliver Goldsmith’s novel The Vicar of Wakefield. Courtesy of the Mark Samuels Lasner Collection at the University of Delaware Library. “I have tried to recreate, in physical form, the world of Victorian Britain—my spiritual home,” said Samuels Lasner. His focus has been on the Pre-Raphaelites and the writers and illustrators of the 1890s, but virtually every creative figure active in Britain between 1850 and 1914 is represented in the collection. Samuels Lasner’s love affair with the Pre-Raphaelites, in particular William Morris and Edward Burne-Jones, began as a teenager, when he met an elderly woman named May Bradshaw Hays, who had known both men while growing up in London in the 1890s. Samuels Lasner’s appreciation of Morris’ and Burne-Jones’ romantic aesthetic derived also from his childhood home, an 1898 Queen Anne revival “cottage.” The tearing down of this house, which his family rented, provided Samuels Lasner the psychological stimulus to collect the Victorians. Three themes undergird the collection’s contents: provenance, networks, and in-depth coverage of the Victorian cultural scene. “The Mark Samuels Lasner Collection is most important, to my mind, for the way that it documents the ongoing interactions of a community of artists, writers, critics, and collectors,” said Barbara Heritage, associate director and curator of collections of Rare Book School at the University of Virginia. 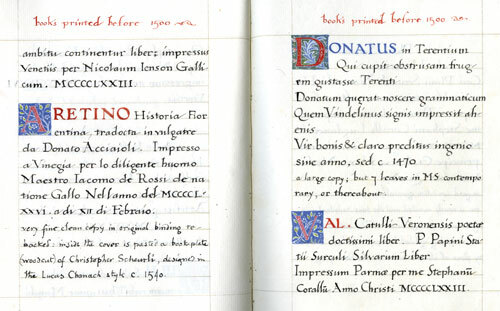 More than 1,200 presentation copies reside in the collection, including John Ruskin’s The Stones of Venice (1851–53), given by the author to Thomas Carlyle; Christina Rossetti’s A Pageant and Other Poems (1881), inscribed to “the Rev. C. L. Dodgson” (Lewis Carroll); and Arthur Conan Doyle’s The Adventures of Sherlock Holmes (1892), inscribed to H. Greenough Smith, editor of the Strand Magazine.